I also made a little progress on HoHRH on Saturday that I forgot to share. Here's the fabric I got at Amy's to go with Mouline Rouge. I think I'm going to use DMC 498 like Sharon (scroll down) did. Her finish turned out so pretty! I had quite a bit of fabric leftover from the fat 1/2, so I decided to try to Vonna's Baking and Basting dyeing technique. I love how it turned out! I'm definitely going to use this technique again. Thanks Vonna for such great instructions! I have also decided to join Paulette, Margaret and few others in a SAL. 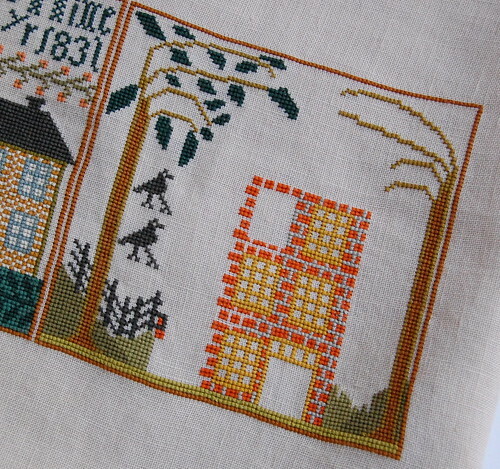 They have been stitching Scarlet Letter's "Ruth Bacheler 1717." I got the pattern a couple weeks ago. I'm planning on using 36 ct. Pearled Barley and DMC threads. I just love this one! 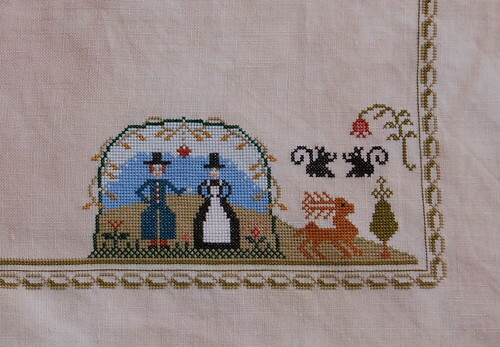 It will be my first Reproduction Sampler! P.S. Thank you for all your very kind comments on Sea to Shining Sea! Wow, Nicole! You're daring to try dyeing fabric. I'm too chicken. lol! And your Kind Fond Love -- yum! I need to pick that up again. Nice colors for Mouline Rouge too. You're so decisive! lol! Nicole, you have a lot of projects. All these big projects going on at the same time! How do you do it? They're beautiful! KFL and HRH are coming along beautifully! I really need to pick up HRH again! I am having trouble sticking to my rotation! Love your new projects too! I love how your fabric came out but you're a brave sole to dye it yourself. 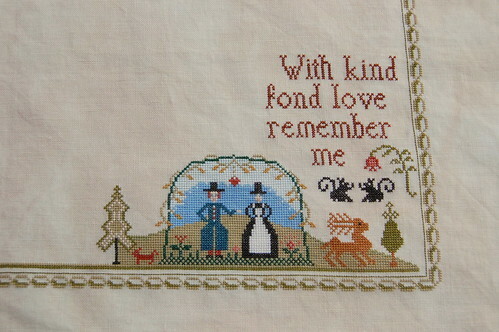 And I love your Kind Fond Love. 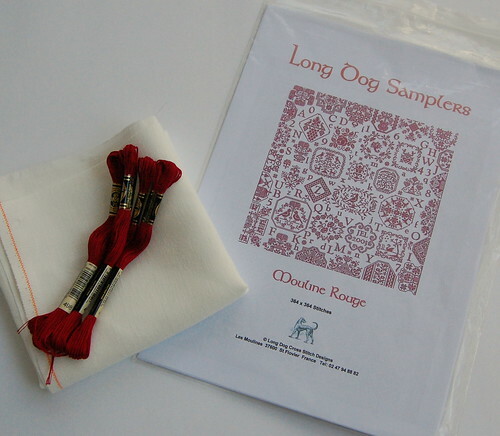 I have to tell you that seeing yours made me pull out my chart, gather threads and put the fabric on rods. Haven't started it yet, but it's hard to resist after seeing yours. I stayed up late watching Bachelor too! I stayed firm in my conviction that Molly was the one... we'll see what holds for tonight's show! We had a whole room full of women...and hubby...watching...It was too fun although I didn't get much stitching done! I need to try dyeing some fabric! Any tips? Some great projects going on there. Congratulations on your latest finish too. Beautiful progress on both pieces!! Love the new stuff and the fabric that you dyed, is fabulous!! OOOH, let me try that again..sorry about the deleted post :) I couldn't spell your name right..LOL!! Both of your WIPs are looking lovely, but I'm particularly enjoying how KFL is coming along. Great progress! I love to look at your beautiful projects. They inspire me. Love your Sea to Shining Sea and all your stitching pictures. Kind Fond Love is gorgeous. I couldn't believe the Bachelor, he's so wishy washy. What an idiot. I am guessing he doesn't end up married to Molly either, LOL. First of all, STSS is so pretty! Congrats on that finish! And your KFL is turning out wonderful. 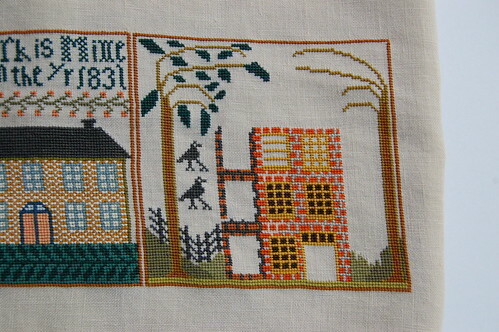 What a nice sampler. Wow, even though you've got lots of projects on Rotation, you're making loads of progress! All very lovely as usual! WOW! You have made tremendous progress on EVERYTHING!!! It all looks so nice, Nicole. Your fabric did turn out perfectly. 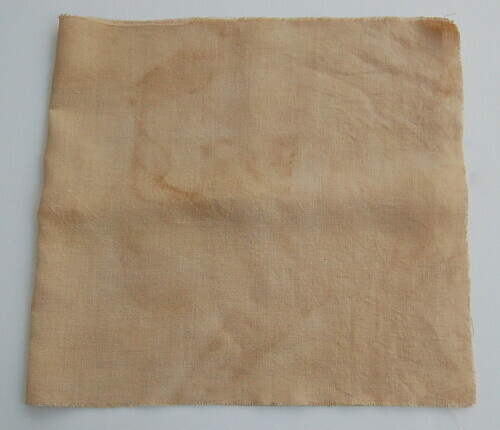 I love staining and dyeing fabric ~ it is so much fun and each is unique. Have fun on Ruth and the LDS! Oh wow, oh wow, oh wow, I love all of your progress and your progress to be. Ruth is stunning. My mouse hovers over the 'order now' button every time I see it. Your fabric turned out great. Well done! 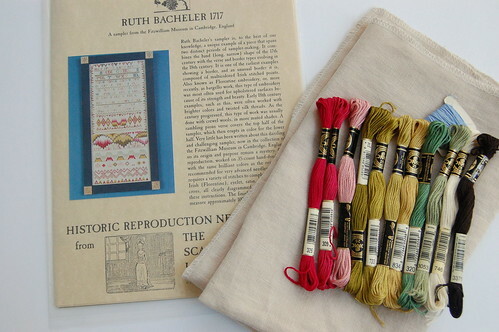 The colors for Ruth Bacheler are gorgeous! You've been really busy with all your other projects. I can't wait to see your start on Moulin Rouge. I can't wait to see your Ruthie. You should have her done sometime next week, right? You turbo stitcher, you! I just love how your baked fabric came out. I still have to try Vonna's recipe. Greta progress on both WIPs you show here. You're a really fast stitcher.